We are currently using Jonathan along with our neighbours for a Party Wall Agreement. My mother who is now quite elderly is somewhat nervous about the procedures involved. Jonathan has been very understanding, and has taken time to visit my mother to allay her fears and confirm everything is in order. Much appreciated! Jonathan was very helpful with the work needed on our party wall agreement. We were up against an exceptionally difficult neighbour and Jonathan was always there to help answer my questions and navigate my way through what was somewhat of an ordeal! I feel he went above and beyond to help and advise me in the situation. I would highly recommend him. I’m delighted with the party wall work Jonathan completed for my loft conversion. From the moment we first spoke his advice was clear and very helpful. He managed to get 3 neighbours signed off on party wall awards within a month with no issues and the costs were as per his estimate. He was always responsive to emails and texts despite having to complete the work close to Christmas so that I could start my project on time. If you are planning a project that requires party wall work I strongly recommend using Jonathan. I also have experience of using a large party wall surveying firm and I can tell you that Jonathan is far more responsive and you really feel he is working with you to get that the sign off you need as quickly as possible. Highly recommend Jonathan, he has been great asset in assisting us throughout our loft conversion and helping issue party wall awards within a tight time frame. From before I committed to a loft conversion I took advice from Jonathan re party wall matters as I had a non-resident neighbour (empty house). He was very helpful, explaining process, reassuring in his advice and ultimately when we needed to get an award, with an independent surveyor involved as well, Jonathan took it all forward with ease and in good time. It was great to have someone to rely on. Jonathan was great to work with. He explained the process and answered any questions we had. Always prompt in replying too. We engaged Jonathan Bayliss regarding a party wall matter and were very happy with the speed and manner of the process. We would definitely recommend him to other clients. Very responsive and professional. Completed Party Wall Award quickly and answered queries. Competitive pricing. Would recommend and use Jonathan again. Do you need party wall advice? Jonathan acted for myself and our neighbour regarding a party wall agreement. He was extremely helpful, honest, polite and very patient. There was a difficult situation that arose, due to another surveyor and difficult neighbour and Jonathan has been very supportive and helpful in dealing with this situation. We would highly recommend him without hesitation. Jonathan served 3 party wall awards for our neighbours when we wanted to carry out building work. He was very quick, responsive and had a great manner with us and our neighbours. If you are looking for a party wall surveyor we would certainly recommend. We hired Jonathan based on a suggestion from our architect and another friend who used his services. Throughout the process of dealing with a party wall issue related to our extension, he was professional and helpful, so I would have no reservation in recommending him. Jonathan explained the party wall process clearly to my neighbour and myself providing reassurance to both of us. His recommendations were reasonable and the award was produced rapidly for a very reasonable price. He was professional and easy to work with answering any questions either of us had. Definitely recommended. I would recommend Jonathan in a heartbeat. From the off, Jonathan was extremely helpful and responsive. He made light work of what could have been a very stressful process given that our adjoining landowner is a local authority. His reputation in the Wandsworth area precedes him – and for good reason. Liz and I both liked your style of work and obvious building knowledge very much. I hope you’ll be happy to come on site in future to help us figure out technical solutions for other works now that we know your rates. ​Jonathan provided great advice and support during a very tricky period during our party wall process. He appointed and dealt with neighbours' surveyor effectively; provided an inspection and produced an award very quickly. And he was very reasonable with his fees. I would whole-heartedly recommend his services. 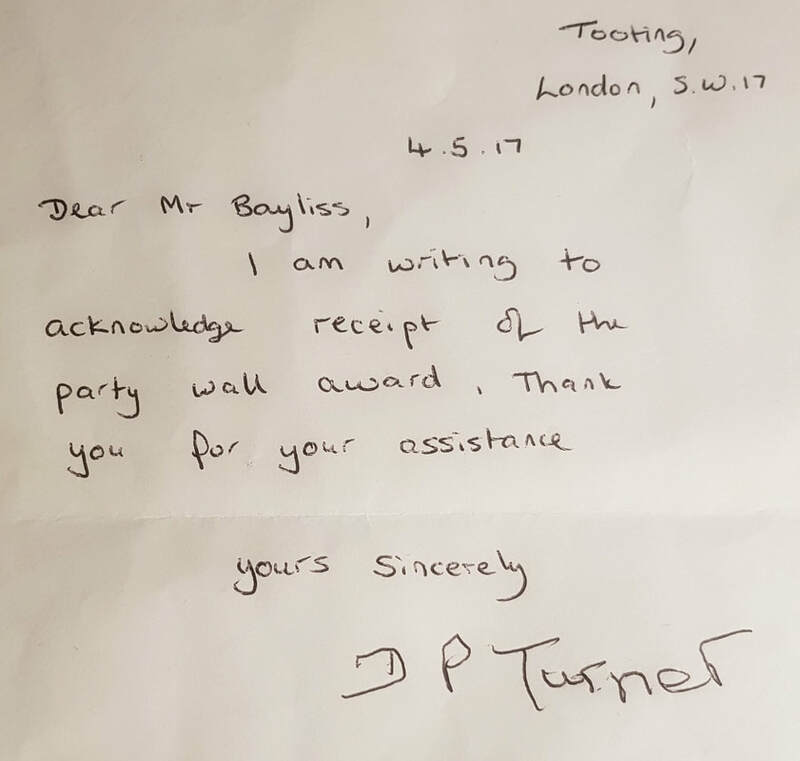 I am very happy to recommend Jonathan Bayliss for his expertise and professionalism in Party Wall matters. We have used him twice for Party Wall Agreements and he has been efficient and courteous to deal with. ​On the second occasion we had a difficult neighbour who caused damage and erected a wall along a boundary with no consultation. Jonathan negotiated a satisfactory resolution on our behalf. I have absolutely no hesitation in recommending him. Jonathan acted jointly for us and a neighbour as Agreed Surveyor for our loft conversion. He was very helpful in explaining the process and options to us (both parties being novices). He was polite, professional, fair and balanced in his approach and very responsive when we needed to reach him. His fees were also more favourable than others quotes we had received. Most importantly he turned the whole thing around very quickly to meet our short time frame and to our mutual satisfaction and has followed up since to check on progress. Thanks Jonathan - you really helped take a bit of stress out of the process and I would definitely recommend you to others. I had a very good experience of working with Jonathan. He is pragmatic and responsive with a priority of minimising your costs. Good to have him on your side - I would definitely use him again. Highly recommended. I would like to take the opportunity of thanking you so much for arranging the Party Wall awards. I never dreamed the process would run so smoothly. I would have no hesitation in recommending you. ​The post has just arrived, including your documents. Thank you for working so quickly and diligently on the party wall award, I would gladly recommend your services in the future. Throughout the preparation of my party wall statement Jonathan acted in a highly professional manner. He was very open and honest during the whole process and was willing to use his professional judgement during some difficult decision-making. What could have been a long drawn-out process was concluded within four weeks of negotiation. This was possible because of Jonathan’s sound judgement at every stage. I can thoroughly recommend him to anyone looking for a party wall surveyor. I have used Jonathan Bayliss Chartered Surveyors on numerous projects and have been very impressed. I am happy to recommend Jonathan as a Party Wall Surveyor based on the efficient and helpful service which he provided for me in connection with the extensive refurbishment and extension of a semi-detached house in Putney. He dealt with everything to fit perfectly with the timing of my building program and provided constructive pro-active advice on all issues. I would use him again on another project. My apologies for not responding earlier. I was in India for work for two weeks and only found out about the papers you had sent when I arrived this weekend. Party Wall bits received, thank you. I paid the invoice last night. A big thank you for actioning this so quickly - really helped us. I would highly recommend Jonathan as a surveyor to anyone, he's only ever been very professional and a pleasure to deal with. I've worked with Jonathan on five occasions now and we've always had a good level of communication. May I take the opportunity of thanking you for all the work that you have completed on our behalf. Your payment has been transferred into the account that was noted on the invoice.